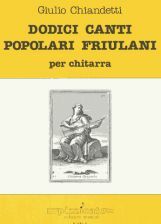 Some of the best known friulano dance music and songs are included in this collection adapted for the guitar. This booklet offers the guitar student the possibility of expressing his creativity, even if he is in his first years of study. It enables him to discover his creativity as well the timbre and harmony of the instrument itself by using the most common techniques such as arpeggios, scales and slurs. At the same time he can contemplate the musical material at his disposal: the intervals. By using various outlines, exercises up to the octave and in harmonic succession are illustrated. Every outline is followed by a purely indicative and intentionally incomplete proposal for performance.The student will create an improvisation on the guitar by using intervals presented in an order of his preference, with a special rhythm and technical and timbre inventions. However, it will be the teacher's role to guide the student in his search for original, but pertinent, performance solutions in view of the limited musical material and the technical skill available.